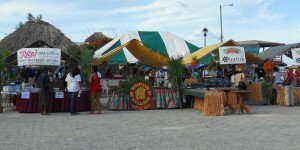 ItÂs hard to imagine a better way to experience the Ambergris Caye lifestyle than visiting during the Lobster Fest! Â So, for the second year, we coordinated our June Grand Baymen Chill Weekend with the Lobster Fest block party.Â And, once again, a good time was had by all. 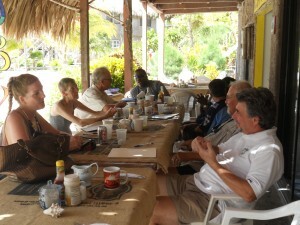 During a normal Chill Weekend we take the group out to a popular local restaurant on Saturday night.Â But first we hold several helpful presentations on Saturday morning, and then tour the town and island after lunch. For the Lobster Fest weekend, we shook it up a bit.Â We wanted to give our visitors a chance to mingle and really enjoy the festival.Â So we reversed our tour on Saturday afternoon so that everyone could check out the Lobster Fest Art Fair in the park. First we stopped for a cone of the scrumptious ice cream at DanDeÂs.Â Then we all walked around town, during the Art Fair.Â The lobster food booths were already being set up.Â The entire town square and street was a mass of activity and color.Â And this gave us a chance to check out what kind of lobster treats would be available that night. In the evening, the entire group came back to town for the massive Lobster Fair block party.Â We gave everyone enough money to sample a variety of tasty lobster dishes and exotic drinks.Â Then we all went our own way.Â The lines can get long.Â So it made sense to let everyone find their own favorite lobster delicacy. Â Our good friends have started a non-profit organization to eradicate this beautiful, but predatory non-indigenous fish.Â Their intrepid diving group regularly heads out diving, with specially designed lionfish spear guns in tow.Â The lionfish spines are poisonous, so they are not easy to catch. Our friends and their group caught 800 lionfish this last week! Â Since the lionfish have no natural predators, we are happy to support the cause.Â The lionfish tidbits were delicate and tasty. Â A perfect accompaniment was the lionfish slayer cocktail. Â IÂll admit that this cocktail went down very easily. 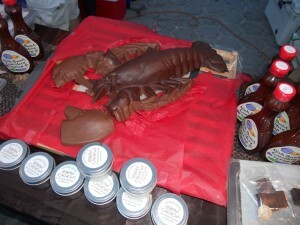 LetÂs not forget dessert!Â Kakaw chocolates had made a 6 pound chocolate lobster for their booth, to be auctioned off.Â They made little lobster and crab chocolates, as well as yummy chocolate crepes.Â That brought back memories of our recent vacation in France. 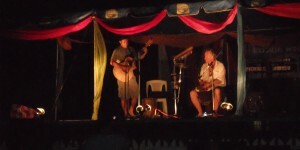 Â Those with teenagers hung around to dance to the live music, in the square or at FidoÂs. 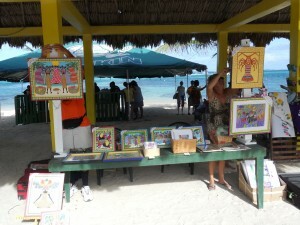 You could come for the Costa Maya Festival, spend a week, and then join us for the Grand Baymen Chill Weekend. We are trying to plan our December Chill Weekend to coincide with the Christmas Boat Parade.Â ItÂs usually held in early December.Â Our current scheduled dates are December 2-4. Â WeÂve now held two December Chill Weekends during the weekend of the Christmas Boat Parade.Â ThatÂs another great option. Or, just come on your own, at anytime.Â WeÂll be happy to meet you and show you Grand Baymen whenever you visit.